Sloppy websites. This is especially galling from online cigar retailers. Misspellings, dead links, and typos tell customers you lack a commitment to quality. Sure, we all make mistakes. That’s why we all need an editor. Hire a good one to go over your site and review every new posting. It’s money well spent. Padrón praise. This company sets an industry standard, thriving without hype or chasing what happens to be hot. With a full line of excellent cigars, Padrón resists trends–like constantly issuing line extensions or “new” blends–and operates with consistent quality and consistency. New entrants in the business could set no higher goal than to emulate Padrón. Box data. Why aren’t the country origins of wrapper, binder, and filler listed on cigar boxes, at least by those manufacturers who put them on their websites? How is a smoker to make a decision about a cigar he’s not seen before in a shop without some information? We aren’t all walking around yet with a smart phone and a cigar app. OK, what’s on your list? Let us know. Well said, George. As long as we're complaining, I'm peeved by expensive cigars that have poor construction, arrogant/negligent tobacco proprietors that act like they don't want my business, and cigar bands that can’t be removed without tearing the wrapper. I have to agree with everything listed. I agree about the boxes. I'd like some more information listed on the box including some dating for when the cigars were boxed so I have an idea how long they've been aging. I also really don't like rude cigar shop owners who either try to continually push you into buying something or act like you are wasting their time. Cigars created in limited run that are sold only in specific areas in the United States. I'm Canadian, and many of these cigars I will never get the opportunity to try because, even if the limited run was larger, they aren't possible to purchase here and generally aren't offered online – only in-store. The term "cuban-esque" used as a marketing term. You're absolutely right about those bands. How can someone go to all the trouble to make a cigar and then have the band applied so sloppily that it actually messes it up? It strikes me as similar to serving wine in a cracked glass that dribbles down your chin. Applying bands is actually one aspect of the cigar-making process where I would welcome some efficient, consistent mechanization. But just some common sense and attention to detail would be good for starters. Cigars listed in catalogs without wrapper, binder, filler origins. Sales on nothing but the latest from Rocky Patel, Padermo, etc. ; what about sales on the standard lines that don't have a limited edition 'boutique' cigar or the 23rd blend within 6 months. Absolutely agree with the rant on house brand MSRPs. And how about online retailers who announce liquidation sales but don't lower their regular prices for them? Also frustrating are manufacturers whose websites have been "under construction" for months. Don't they want people to know about their product? Speaking of sloppy websites, is it too much trouble for an online vendor to note which cigars listed for sale are actually out of stock? First post! I am new the world of cigars, and have been having a blast reading review sites (especially this one!). Even though I am new to the scene I have already encountered most of these problems, and I agree with the ones I haven't even encountered! 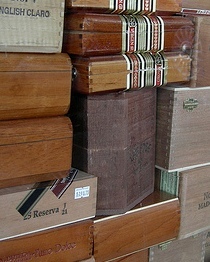 I can't stand smoke shops that have humidors, but the owner/ employee know nothing of cigars! I mean I know almost nothing, but some of these guys are ridiculous! I have walked in, asked for a recommendation and been told “Cohiba, best around, smoke Cohiba!”…and that’s it, no description, no reasoning, just smoke Cohiba! (The most expensive cigar in his case mind you). I have also been accused of theft, simply because I went into a humidor and walked out with nothing, I mean if you are willing to have people browse your selection lock the door and throw away the key! But all that has been resolved, I have found a few great cigar/pipe shops in the Twin Cities and will be sticking to them! My pet peeve is expensive cigars with an overly tight draw. I've had some where it is impossible to loosen them up and it detroys the entire experience for me. It's hard to enjoy a cigar you can barely pull the smoke out of.